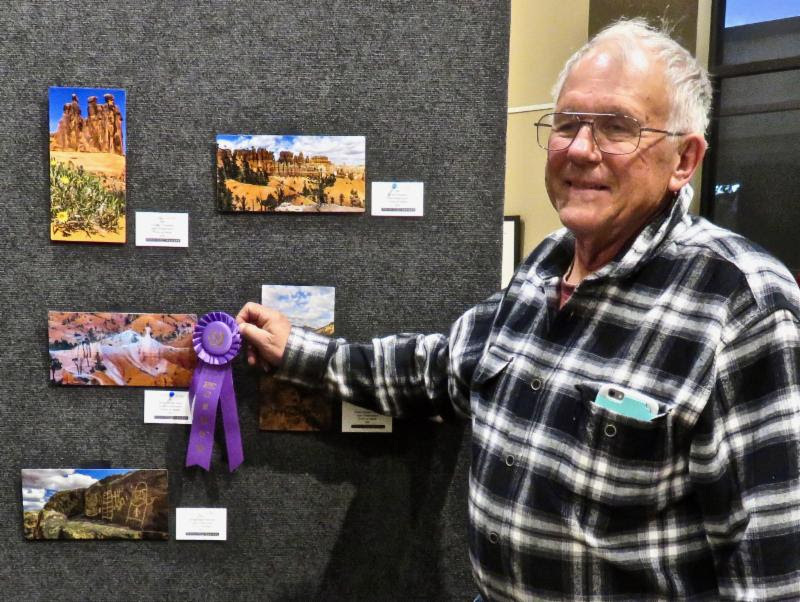 ST. GEORGE — The Southern Utah Art Guild is pleased to announce the winners of their holiday art show “The Gift of Art,” which is on display at the Red Cliff Gallery through Dec. 20. The show features approximately 100 works of art from about 40 Southern Utah artists, who are showcasing work in a variety of media, including all types of paint, photography, mixed media, pottery, sculpture and more. The Red Cliff Gallery, located in the St. George City Commons Building at 220 N. 200 East, is open Monday-Saturday, 10 a.m. to 5 p.m.
Best of Show: Duke Brietenbach for “Bryce White Knob” – photography. First Place: Gayla Folkman for “Burst of Color 1” – oil. Second Place: George Kehew for “Bees Four” – acrylic. Third Place: Annie Barber for “Purple Flowers” – watercolor. Alan Curtis for “Nebula” – acrylic. Deann Rex for “Indian Dancer” – watercolor. Cheryl Sachse for “Dancing Squid” – acrylic. Mel Scott for “Pink Daisy” – alcohol ink. Ralph Edwin Malloy for “Kayenta” – mixed media. Holly Varszeji for “The Gift” – collage. The judge for “The Gift of Art” show was Sandra Feldman. All of the art will be available for sale. When: Monday-Saturday, 10 a.m. to 5 p.m. through Dec. 20.